Aluminum force table to demonstrate Newton's Laws. This feature-packed Precision Force Table is the classroom standard for demonstrating the law of composition and resolution of forces. 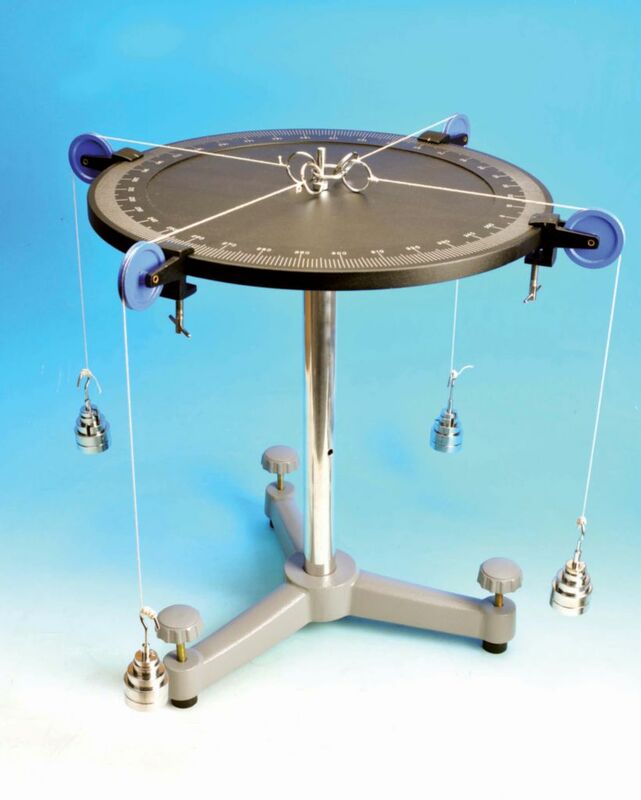 Includes: (1) Force table (4) Pulleys (4) Weight hangers (16) Chrome plated weights. 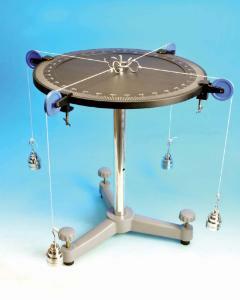 Force table is precision-machined aluminum and 40 cm in diameter. Its rim has a scale graduated in 360 degrees, and mounted on a vertical support rod with leveling screws. Specially designed with a ring in the center of the force table, fastened by cords passing over four pulleys, to add extra stability and reduce annoying wobble. Set includes four pulleys, four weight hangers of 100 g each, and an additional sixteen weights (4 x 10 g, 4 x 20 g, 4 x 50 g and 4 x 100 g). Weights are made of steel and chrome plated. The 40cm-diameter, extra thick machined aluminum tabletop has a laser engraved rim with graduations for accurate and easy-to-read measurements. The pulley clamps are specially designed to conform to the curve of the circular table so your pulleys won't wobble. Low inertia pulleys with miniature bearings of negligible friction, and a central fiducial mark ensure parallax-free angle readings. The sturdy support rod and heavy tripod base with leveling screws give stable support. The heavy center pin fits snugly into the tabletop for easy assembly.